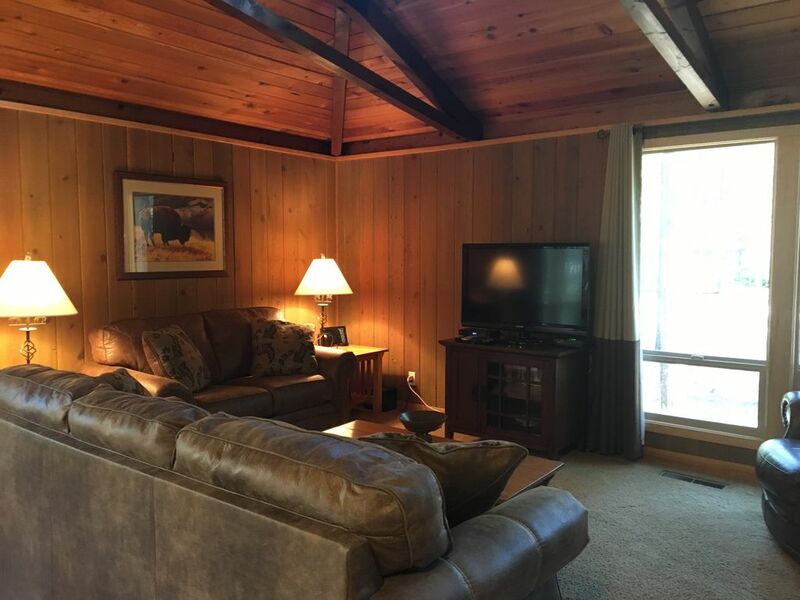 Sunriver Location: 12 Backwoods Lane is ideally located just a two minute walk across Abbott Drive to the Sunriver Village Mall, and the SHARC Aquatic & Rec Center is a short 5 minute bike ride. There is an extensive common area of open lodgepole pine forest on two sides of the home that provides privacy. SHARC Facility: The new Sunriver Homeowners Aquatic & Recreation Center is a short walk or bike ride away and year-round access is included with your booking. We provide 6 passes to the SHARC facility with all bookings. Attention to Quality: As owner-managers we are focused on quality. Living a short 15 minutes away from Sunriver in Bend, we are able to oversee the condition of our properties and check on our homes between guests. This ensures that maintenance items have been addressed and the home is prepared for your arrival. We are willing to pay slightly more for our housekeeping service because they consistently meet our standard of quality. Living Area: This attractive, quality furnished, 1100 sq ft home has a cabin ambiance. The living and dining area feature exposed beams and a vaulted cedar tongue and groove ceiling. Upper windows along the ridge provide an openness to the beauty of the outdoors. The gas fireplace adds warmth in the winter, while the central air conditioning will be appreciated on those warm summer days. There is a 32 inch LCD TV with cable, DVD, bluetooth stereo, and Wi-Fi high speed internet access. Kitchen & Dining: The recently-remodelled kitchen is open to the living and dining areas. The dining room table provides seating for 6, and the breakfast bar has additional seating for 2. From the dining area there is direct access through a sliding glass door to the deck with outdoor furnishings and gas BBQ. The kitchen is fully supplied with commonly used cooking utensils, pots and pans, dishes and silverware. Attention to detail includes fresh coffee beans and a grinder for those who enjoy a cup or two to start the morning. Bedrooms & Baths: The master suite has a king bed with private bath, while the second bedroom provides a queen bed and set of bunks with hall bath nearby. Both bedrooms have LCD TVs with DVDs. A double hide-a-bed is located in the living area. In the baths you will find a selection of upgraded starter toiletries that includes shampoo and soap, as well as a hair dryer. Deck & Hot Tub: Through the sliding glass door off the dining area is a large deck with patio furnishings, hot tub for 5, and gas barbecue. Parking & Bikes: The property includes a large paved driveway and enclosed bike shed. Four adult cruiser bikes and a Burley 2-child bike trailer are provided. Amenities: SHARC Passes, King Master Suite, Hot Tub, Air Conditioning, Wi-Fi and Cable Internet Access, Gas Fireplace, LCD TVs with DVDs throughout, Gas BBQ, 4 Cruiser Bikes, 2-Child Burley Bike Trailer, Portable Crib and Booster Seat. Sunriver Resort: Sunriver is located on the east slopes of the Cascade Mountains in the heart of central Oregon's recreational paradise. This popular, world-class resort has extensive bike paths, three 18-hole golf courses, tennis courts, swimming pools, parks, and shopping center with a variety of shops and restaurants. Mt Bachelor ski area is just 20 minutes away, along with the Cascade Lakes recreational area and nearby High Desert Museum & Lava Lands Visitors Center. Pets Allowed, No Smoking: Pets are allowed with $15/night per pet fee. We appreciate time with family and friends, relaxing and enjoying the beauty of the world around us. Our vacation homes in Sunriver provide a quality and affordable way for you to experience what Sunriver and central Oregon have to offer, and the joy of spending time with those you love. It is sharing this experience with our guests that motivate us. Our goal is to provide the quality of homes and service that we desire and expect for ourselves. The Home is Surrounded by an Open Lodgepole Pine Forest. Hot Tub, Gas BBQ, Wi-Fi and Cable High Speed Internet Access, Central Air Conditioning, 3 LCD TVs with Cable & DVDs, Large Deck, 4 Adult Cruiser Bikes, Burley 2-Child Bike Trailer, 6 SHARC (Sunriver Homeowner Aquatic & Recreation Center) passes. SHARC (Sunriver Homeowners Aquatic & Recreation Center - outdoor/indoor pools, water slide, year around tubing hill, park/play ground), Mt. Bachelor Ski Area, Sunriver Village Mall Shops and Restaurants, Golf, Tennis Courts, Bike Paths, Sunriver Nature Center and Observatory, High Desert Museum, Lava Lands Visitors Center.